Cotton is a shrubby plant that is a member of the Mallow family. Its name refers to the cream-colored fluffy fibers surrounding small cottonseeds called a boll. The small, sticky seeds must be separated from the wool in order to process the cotton for spinning and weaving. De-seeded cotton is cleaned, carded (fibers aligned), spun, and woven into a fabric that is also referred to as cotton. Cotton is easily spun into yarn as the cotton fibers flatten, twist, and naturally interlock for spinning. Cotton fabric alone accounts for fully half of the fiber worn in the world. It is a comfortable choice for warm climates in that it easily absorbs skin moisture. Most of the cotton cultivated in the United States is a short-staple cotton that grows in the American South. Cotton is planted annually by using the seeds found within the downy wool. The states that primarily cultivate cotton are located in the "Cotton Belt," which runs east and west and includes parts of California, Alabama, Arkansas, Georgia, Arizona, Louisiana, Mississippi, Missouri, New Mexico, North Carolina, Oklahoma, South Carolina, Tennessee, and Texas, which alone produces nearly five million bales. Together, these states produce approximately 16 million bales a year, second only to China. Business revenue generated by cotton today is approximately $2 billion — one of the greatest revenues of any Australian crop. The cotton plant is a source for many important products other than fabric. Among the most important is cottonseed, which is pressed for cottonseed oil that is used in commercial products such as salad oils and snack foods, cosmetics, soap, candles, detergents, and paint. The hulls and meal are used for animal feed. Cotton is also a source for cellulose products, fertilizer, fuel, automobile tire cord, pressed paper, and cardboard. Cotton was used for clothing in present-day Peru and Mexico perhaps as long as 5,000 years ago. Also, cotton was grown, spun, and woven in ancient India, China, Egypt, and Pakistan, around 3000 B.C. Cotton is not native to Western Europe. Around A.D. 800, Arabic traders likely introduced cotton to Spaniards. By the fourteenth century, Mediterranean farmers were cultivating the cotton plant and shipping the fiber to the Netherlands for spinning and weaving. British innovations in the late 1700s include water-powered spinning machinery, a monumental improvement over hand-spinning. An American named Samuel Slater, who worked with British machinery, memorized the plans for a machine spinner and returned to Rhode Island to set up Slater Mill, the first American textile mill to utilize machine spinners. This mill represents the beginning of the U.S. Industrial Revolution, built on the mechanism of the cotton industry. Two developments spurred the cultivation of American cotton: cotton spinners and the cotton gin. The cotton gin, developed by Eli Whitney in 1793, easily removed tenacious cottonseeds. Southern plantation owners began planting cotton as a result of these innovations, using enslaved labor for harvesting the cotton. Vigorous cotton cultivation in the South using enslaved labor is considered one reason for friction between North and South that led to the Civil War. Southern cotton was shipped to New England mills in huge quantities. As a result of machine spinning, weaving, and printing, Americans could cheaply purchase calico and it became universally worn. However, labor costs were significant in New England. Mill owners found ways to reduce those costs, first by employing women and immigrants who were often paid poorly, then by employing young children in the factories. After oppressive labor practices were largely halted, many factories moved to the South where labor was cheaper. (Unionizing efforts affected the profits of those mills.) Today, a fair amount of cotton is woven outside the United States where labor is less costly. Polyester, a synthetic, is often used along with cotton, but has little chance of supplanting the natural fiber. The materials required to take cotton bolls to spun cotton include cottonseeds for planting; pesticides, such as insecticides, fungicides, and herbicides, to battle disease and harmful insects; and fertilizers to enrich the soil. There are agricultural requirements for growing cotton in the United States. Cotton has a long growing season (it can be as long as seven months) so it is best to plant cotton early—February in Texas but as late as June in northern cotton-growing states such as Missouri. Cotton should not be planted before the sun has warmed the soil. It performs best in well-drained, crumbly soils that can hold moisture. It can be grown between latitudes of 30° north and 30° south. Good cotton crops require a long, sunny growing season with at least 160 frost-free days and high moisture levels resulting from rainfall or irrigation during the growing season. However, too much rain during harvest or strong winds during picking can damage the open bolls and load the fiber with too much water, which can ruin the cotton in storage. Generally, a cotton farmer must farm about 2,000 acres (20,000 hectares) if the operation is to be economically viable. On average, an acre will produce about 1.5 bales of cotton, or about 750 lb (340 kg). In spring, the acreage is cleared for planting. Mechanical cultivators rip out weeds and grass that may compete with the cotton for soil nutrients, sunlight, and water, and may attract pests that harm cotton. The land is plowed under and soil is broken up and formed into rows. Cottonseed is mechanically planted by machines that plant up to 12 rows at a time. The planter opens a small furrow in each row, drops in seed, covers them, and then packs more dirt on top. Seed may be deposited in either small clumps (referred to as hill-dropped) or singularly (called drilled). The seed is placed 0.75 to 1.25 in (1.9 to 3.2 cm) deep, depending on the climate. The seed must be placed more shallowly in dusty, cool areas of the Cotton Belt, and more deeply in warmer areas. With good soil moisture and warm temperature at planting, seedlings usually emerge five to seven days after planting, with a full stand of cotton appearing after about 11 days. Occasionally disease sets in, delaying the seedlings' appearance. Also, a soil crust may prevent seedlings from surfacing. Thus, the crust must be carefully broken by machines or irrigation to permit the plants to emerge. Approximately six weeks after seedlings appear, "squares," or flower buds, begin to form. The buds mature for three weeks and then blossom into creamy yellow flowers, which turn pink, then red, and then fall off just three days after blossoming. After the flower falls away, a tiny ovary is left on the cotton plant. This ovary ripens and enlarges into a green pod called a cotton boll. The boll matures in a period that ranges from 55 to 80 days. During this time, the football-shaped boll grows and moist fibers push the newly formed seeds outward. As the boll ripens, it remains green. Fibers continue to expand under the warm sun, with each fiber growing to its full length—about 2.5 in (6.4 cm)—during three weeks. For nearly six weeks, the fibers get thicker and layers of cellulose build up the cell walls. Ten weeks after flowers first appeared, fibers split the boll apart, and cream-colored cotton pushes forth. The moist fibers dry in the sun and the fibers collapse and twist together, looking like ribbon. Each boll contains three to five "cells," each having about seven seeds embedded in the fiber. Most steps involved in the production of cotton have been mechanized, including seeding, picking, ginning, and baling. Samples are taken from the bales to determine the quality of the cotton. Most steps involved in the production of cotton have been mechanized, including seeding, picking, ginning, and baling. Samples are taken from the bales to determine the quality of the cotton. At this point the cotton plant is defoliated if it is to be machine harvested. Defoliation (removing the leaves) is often accomplished by spraying the plant with a chemical. It is important that leaves not be harvested with the fiber because they are considered "trash" and must be removed at some point. In addition, removing the leaves minimizes staining the fiber and eliminates a source of excess moisture. Some American crops are naturally defoliated by frost, but at least half of the crops must be defoliated with chemicals. Without defoliation, the cotton must be picked by hand, with laborers clearing out the leaves as they work. Harvesting is done by machine in the United States, with a single machine replacing 50 hand-pickers. Two mechanical systems are used to harvest cotton. The picker system uses wind and guides to pull the cotton from the plant, often leaving behind the leaves and rest of the plant. The stripper system chops the plant and uses air to separate the trash from the cotton. Most American cotton is harvested using pickers. Pickers must be used after the dew dries in the morning and must conclude when dew begins to form again at the end of the day. Moisture detectors are used to ensure that the moisture content is no higher than 12%, or the cotton may not be harvested and stored successfully. Not all cotton reaches maturity at the same time, and harvesting may occur in waves, with a second and third picking. Next, most American cotton is stored in "modules," which hold 13-15 bales in water-resistant containers in the fields until they are ready to be ginned. The cotton module is cleaned, compressed, tagged, and stored at the gin. The cotton is cleaned to separate dirt, seeds, and short lint from the cotton. At the gin, the cotton enters module feeders that fluff up the cotton before cleaning. Some gins use vacuum pipes to send fibers to cleaning equipment where trash is removed. After cleaning, cotton is sent to gin stands where revolving circular saws pull the fiber through wire ribs, thus separating seeds from the fiber. High-capacity gins can process 60, 500-lb (227-kg) bales of cotton per hour. Cleaned and de-seeded cotton is then I 0 compressed into bales, which permits economical storage and transportation of cotton. The compressed bales are banded and wrapped. The wrapping may be either cotton or polypropylene, which maintains the proper moisture content of the cotton and keeps bales clean during storage and transportation. Every bale of cotton produced in the United States must be given a gin ticket and a warehouse ticket. The gin ticket identifies the bale until it is woven. The ticket is a bar-coded tag that is torn off during inspection. A sample of each bale is sent to the United States Department of Agriculture (USDA) for evaluation, where it is assessed for color, leaf content, strength, fineness, reflectance, fiber length, and trash content. The results of the evaluation determine the bale's value. Inspection results are available to potential buyers. After inspection, bales are stored in a carefully controlled warehouse. The bales remain there until they are sold to a mill for further processing. Cotton growing is a long, involved process and growers must understand the requirements of the plant and keep vigilant lookout for potential problems. Pests must be managed in order to yield high-quality crops; however, growers must use chemicals very carefully in order to prevent damage to the environment. Defoliants are often used to maximize yield and control fiber color. Farmers must carefully monitor moisture levels at harvesting so bales will not be ruined by excess water during storage. Soil tests are imperative, since too much nitrogen in the soil may attract certain pests to the cotton. Expensive equipment such as cotton planters and harvesters must be carefully maintained. Mechanical planters must be set carefully to deposit seed at the right depth, and gauge wheels and shoes must be corrected to plant rows at the requisite spot. Similarly, improperly adjusted machinery spindles on harvesting machines will leave cotton on the spindle, lowering quality of the cotton and harvesting efficiency. A well-adjusted picker minimizes the amount of trash taken up, rendering cleaner cotton. 13. Cotton lint makes up about 42% of the picked cotton by weight, and contributes about 85% of the total income from a cotton crop. The other 15% of income is from cottonseed. 1. Bales of cotton of various grades are moved from the WAREHOUSE to the BALE OPENING room. 2. Selected bales are opened and placed in position beside the BREAKING and OPENING machine. This is actually a line of machines, working as a unit, that tear apart and partially clean matted, compressed, and baled cotton. The result is small loose bunches of cotton. 3. The cotton is then placed into the BLENDING MACHINE. This is a group of devices that are synchronized to proportion definite amounts of various grades of cotton which are to be blended together. 4. At this time, matted cotton and waste yarn salvaged from operations in the mill are placed into the WASTE MACHINE. This machine beats, pulls apart, and fluffs up waste cotton to prepare it for re-use. 5. Cotton from both the BLENDING MACHINE and the WASTE MACHINE is fed into the BREAKER PICKER. In this unit the raw cotton is partially cleaned by beating and fluffing and then fed into the FINISHER PICKER. 6. The FINISHER PICKER receives partially cleaned cotton in the form of LAP from the BREAKER PICKER and completes the cleaning and fluffing process. LAP is a general term used to designate wide sheets of loosely matted cotton. 7. The cotton is next processed by a CARDING MACHINE, where dirt and short fibers are removed, other fibers are laid parallel and formed into a ropelike strand called a SLIVER. The SLIVER is deposited in large cylindrical containers called CANS. 9. For better grade yarn, the SLIVER is first processed by the SLIVER LAPPING MACHINE, which draws and combines several strands of SLIVER into a sheet of LAP and winds it on a spool ready for RIBBON LAPPING or COMBING. 10. The LAP is processed by a RIBBON LAPPING MACHINE which draws and combines several rolls of LAP into one roll of RIBBON LAP, straightening the fibers slightly and making the lap more uniform in weight and texture, ready for feeding to a COMBING MACHINE. RIBBON LAP is a roll of closely matted cotton fibers, about 10 inches wide. 11. COMBING is the process of extracting fibers below a predetermined length and removing any remaining dirt. Output of the COMBING MACHINE is deposited in CANS. 12. The cotton is next processed by the DRAWING FRAME. It is a machine in which several strands of SLIVER are combined into one strand and DRAWN OUT so that the combined strands approximate the weight and size of any one of the original strands. The term DRAWN OUT means to stretch a strand of cotton, usually by running the strand between several pairs of rollers, each pair turning faster than the pair before it. 13. The SLUBBING MACHINE then draws out strands of SLIVER and twists them together loosely in order to give the strands (now called ROVING) sufficient strength to withstand subsequent operations. 14. The ROVING is processed by the FLY FRAME. This machine progressively combines two strands of partially processed ROVING into one, draws out the combined strands until they are of prescribed weight, and twists them loosely in order to give them sufficient strength to withstand subsequent operations. 1. The cotton is now ready for SPINNING. Spinning is the process of making YARN from cotton fibers by drawing out and twisting the fibers into a thin strand. That is, one or more strands of slightly twisted ROVING are used to produce one strand of spun YARN. The yarn is wound on bobbins. 2. The next step is to produce either WARP or FILLING. WARP is the set of yarn strands which run lengthwise in a piece of cloth. FILLING, also called WOOF and WELT, is the yarn which is interlaced through the WARP to produce cloth. a. FILLING may be single-ply or multiple-ply. 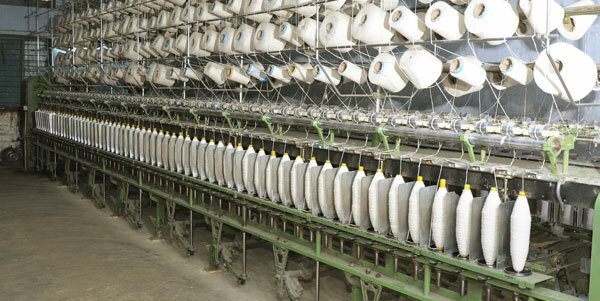 For multiple-ply, steps (a) and (b) for making WARP below are completed before the yarn is conditioned. For single-ply, the yarn is immediatly conditioned after spinning. Conditioning is the act of exposing bobbins of FILLING YARN to steam or to a spray of conditioning solution in order to set the twist, to remove kinks from the yarn, and to prevent its kinking in subsequent processes. a. The DOUBLING MACHINE winds two or more strands of yarn onto one PACKAGE without twisting them. PACKAGE is simply a general term for any wound arrangement of YARN. b. The yarn is then TWISTED. The TWISTING MACHINE twists two or more strands of spun yarn into a heavier, stronger, single strand. This process may be repeated until the desired number of plys is produced. c. The WINDING MACHINE winds yarn from several bobbins in a continuous length onto a spool. Output is CHEESES or CONES of yarn to be used for WARP. The term CHEESE refers to a roll of yarn built up on a paper or wooden tube in a form that resembles a bulk cheese. A CONE is a tapered cylinder of wood, metal, or cardboard around which yarn is wound. 3. The WARP may, or may not, be dyed. If not, then it is next processed by the WARPING MACHINE. This machine takes about 500 strands of yarn and winds them side by side onto one large spool called a SECTION BEAM. The SECTION BEAM is about three feet in diameter. Processing continues at step 6 below. 4. If the WARP is to be dyed, it is processed by the BALL WARPING MACHINE. This machine takes about 500 strands of yarn and gathers them together into a large, loose, rope-like strand, and winds it on a wooden core preparatory to dyeing. The yarn is then dyed in a different location, producing rolls of dyed WARP YARN. 5. The dyed yarn is processed by the BEAMER MACHINE which separates the individual strands of dyed yarn and winds them onto one large spool (BEAM). The result is the same as step 3 above. 6. The SLASHING MACHINE takes the yarns from several SECTION BEAMS and winds them side by side onto one wider spool called a LOOM BEAM. 1. WEAVING is the interlacing of WARP and FILLING YARN to form a cloth. 1. 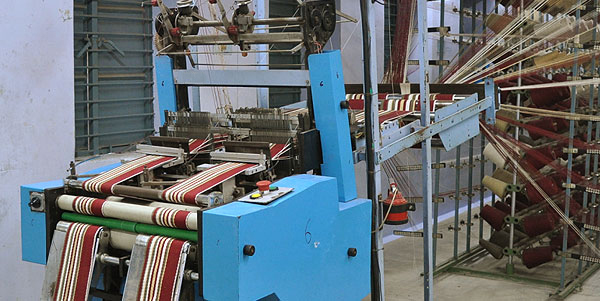 The inputs to the weaving process, performed on a LOOM, are (1) the WARP YARN from the LOOM BEAM (2) the FILL YARN from a bobbin, and (3) the mechanism that controls the design to be applied to the cloth (see Designing below). 2. If there is no LOOM BEAM currently in the LOOM, the new BEAM must be DRAWN-IN. DRAWING IN is the process of threading the WARP filaments from the LOOM BEAM into the LOOM in the order indicated by the design to be applied to the cloth (see Designing below). If the current LOOM BEAM has been exhausted, the yarn ends from the new BEAM are twisted or knotted to the ends of the exhausted BEAM. 3. As the LOOM runs, the longitudinal strands of WARP YARN are positioned so that every other strand is raised. A pointed block of wood called a SHUTTLE pulls the FILLING YARN through the strands. The position of the WARP YARN strands are then reversed and the SHUTTLE pulls the FILLING YARN in the reverse direction. This process then repeats. Note that this description is for a simple weave. 4. As bobbins are emptied, any remaining yarn is removed from them and returned to the waste machine for salvage. The clean bobbins are then returned to the spinning operations. 5. Cloth produced by the loom is wound on a large roll and sent to the STITCHING MACHINE, where lengths of cloth are stitched together. 6. The SHEARING MACHINE cuts away knots and loose yarn ends from the surface of the cloth to give it a smooth surface. 7. Finally, the cloth is inspected, graded for quality, and delivered to shipping. 1. Designing is the process of deciding on the pattern that is to be woven into a cloth and also the basic weave (plain, twill, or satin). The design is drawn on cross-section paper and called a DESIGN DRAFT. 2. There are two primary types of LOOMS - the DOBBY LOOM and the JACQUARD LOOM. The former is adequate for simple weaves, while the latter is required for more complex weaves. The main difference in the two LOOMs lies in how the individual WARP YARN threads are controlled, as explained below. a. The HEDDLE is a fiber or metal strand, pierced with a hole (eye), through which a WARP YARN strand is threaded. b. The HARNESS is an assemblage of HEDDLES attached to a HARNESS FRAME. A separate HARNESS is used for each group of WARP YARN strands that must be moved independently to weave a desired pattern. 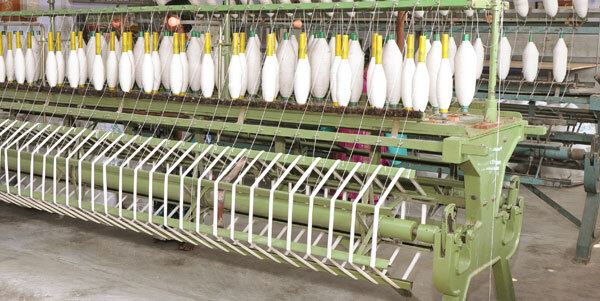 c. Each HARNESS FRAME is fastened to a mechanism that raises and lowers it in proper sequence to form the SHEDS through which the SHUTTLE carries the FILLING YARN to produce cloth of a specified pattern. The SHED is the opening made across the WARP by the raising of some threads and the depressing of others. It is through this opening that the SHUTTLE passes and lays the cross of FILLING YARN of a fabric. d. A two-harness LOOM (one with two sets of HEDDLES) can produce plain weaves. Three or more HARNESSES are required to produce twill fabrics. Other types of fabrics may require a minimum of five HARNESSES. e. The cloth designer converts the DESIGN DRAFT into a PATTERN CHAIN, an arrangement of wooden crossbars and metal pegs which is used to control the WEAVING of cloth designs and patterns on the DOBBY LOOM. The metal pegs, about an inch long, determine which HARNESSES are raised and when. a. Each strand of WARP YARN can be individually controlled. The HEDDLE HARNESS of the DOBBY LOOM is replaced by a series of upright wires with hooks at their upper ends. The hooks are attached to a controlling head high above the loom. The Jacquard head is controlled by a punch card system. b. The cloth designer converts the DESIGN DRAFT into punched cards. The presence or absence of holes in each card determines whether each WARP YARN strand is raised or lowered. The cards are fed through the Jacquard head at the rate of one card for each pass of the SHUTTLE. Available in our Underwear range is a variety of products that we directly manufacture. Frank and Beans Mens range includes Boxer Shorts, Boxer Briefs, Briefs and Satin Boxer Shorts. Our exclusive Womens range that we manufacture inlcude G Strings, Full Briefs, Bikini Briefs and Boylegs.